It is rare both in its natural environment and certainly in cultivation, however Caladenia phaeoclavia is worth looking for. It is a rather diminutive species that hide amongst grasses, so finding it in the wild usually means waiting for it to flower. 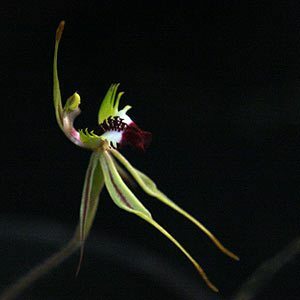 When it does flower it reaches around 25cm in height and had one of the most intriguing flowers of any orchid species. They grow in open woodlands, a little shade and excellent drainage. The flower is a combination of green red and cream, however it is the form of the flower that makes the search for this elusive orchids well worthwhile. Caladenia are a wonderful genus of native orchids, and Caladenia phaeoclavia is no exception. Known as the Brown Clubbed spider orchid Caladenia phaeoclavia is a fascinating species found from Victoria through to New South Wales. Usually in the cooler foothills to around 600m. With a nice upright habit to around 25cm, this is a spring flowering species which dies back as soon as the heat of summer hits. It prefers a position near the forest margins in part shade to full sun. Like most terrestrial native orchids it also requires good drainage. The flower of Caladenia phaeoclavia is attractive, green with a white stripe and maroon tip. These are difficult to grow in cultivation, however they can be started from seed if you can find it. They do not transplant well and established plants usually die if an attempt is made to transplant them. If you can buy a potted specimen then you may be in luck. otherwise grow them from seed, or simply admire them in the wild. Best in an open Eucalyptus forest. Flowering time is early summer.